Ladies and gentleman, we're switching our street style up a bit on this Friday afternoon. While NYC is chock-full of super-stylish city-dwellers, it's not always about the clothes. With all kinds of amazing outfits constantly on display, it's easy to forget that great style is truly a head-to-toe affair. Thus, we're honoring two gorgeous subjects whom have their hair styles color down pat. 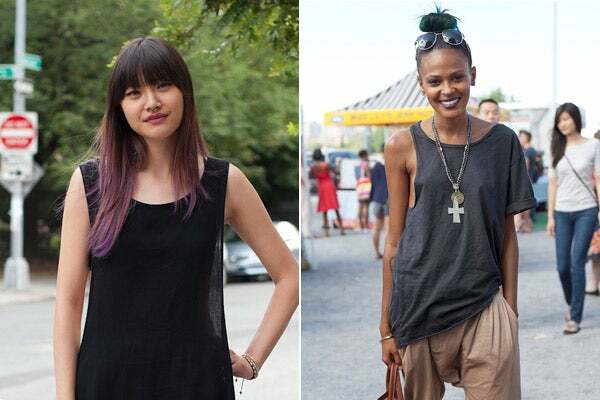 The art of the dip dye can be oh-so tricky, but Gia and Crystal here are masters of hue. We're crushing on the fun and flirty shades they're rocking — and might we mention how seriously flattering their respective colors are? With fall just around the corner, maybe it's time to start thinking about turning over a new leaf — in every shade of the rainbow.